Challenge Team Member Jill Dewey Hawkins spotted this fun card from Sharna in the My Favorite Things Flickr group (did you know we have one of those? Check it out!) Jill says, "Thought this was a fun one! Shakin' it up and all! :)" Looks like the sweet kitty from the I Knead You stamp set is having a rather vivid dream! Design Team Member Mayuri spotted Ardyth's sweet card on Instagram. Ardyth created this card using Sketch 244 from our Wednesday Sketch Challenge. Mayuri says, "I love how she stacked those birds from Things With Wings!" I do, too. SUPER cute! 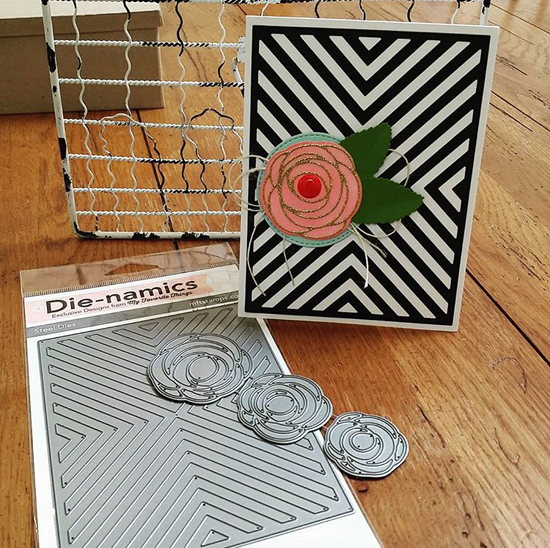 I spotted Sam's card on Instagram using the Four Way Chevron Cover-Up and the Scribble Roses Die-namics. I love the juxtaposition of the graphic background with the soft flower, and gold is ALWAYS the perfect final touch. Fabulous product placement, too, Sam! 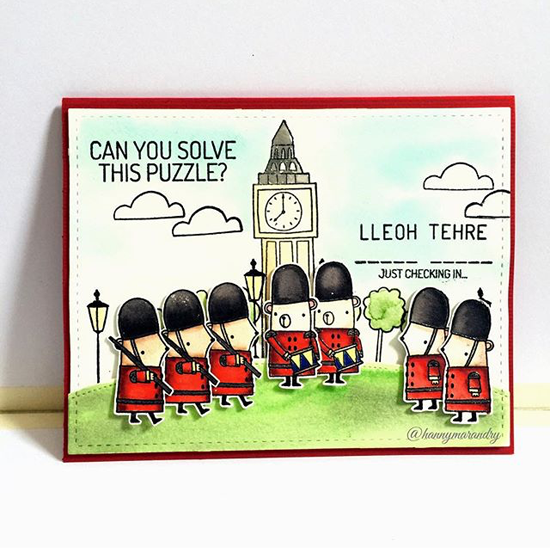 MFT Social Media Maven Erica Hernandez spotted this clever card from Hanny on Instagram using the #mftstamps. Erica LOVED what Hanny did with the London Mouse stamp set. 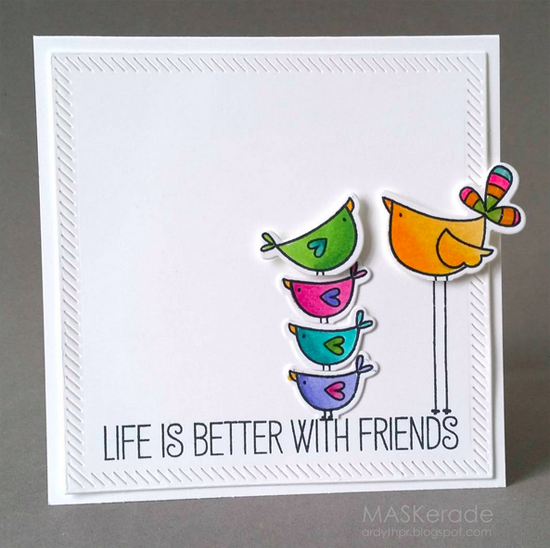 Design Team Member Kay Miller spotted Tracey's card on her blog. It's a fun reminder of the Summer of 2015 when we relaxed and unwound with tropical drinks! 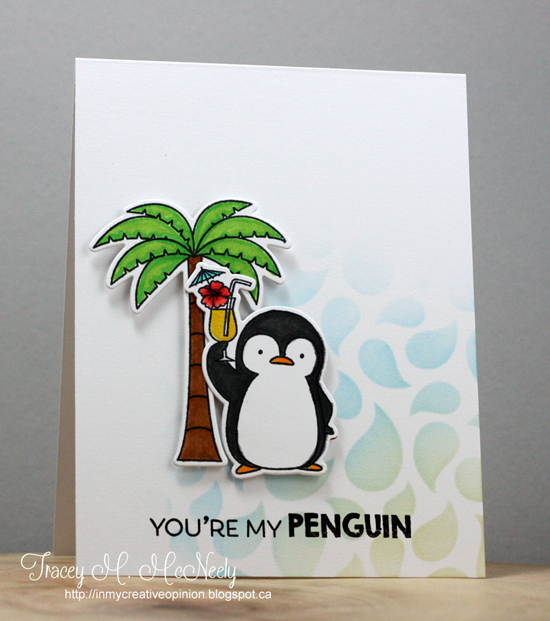 This little guy from the Penguins in Paradise stamp set was pretty popular this summer. Kay says, "I love the stenciling Tracey did for her background and her little tropical scene is adorable!" 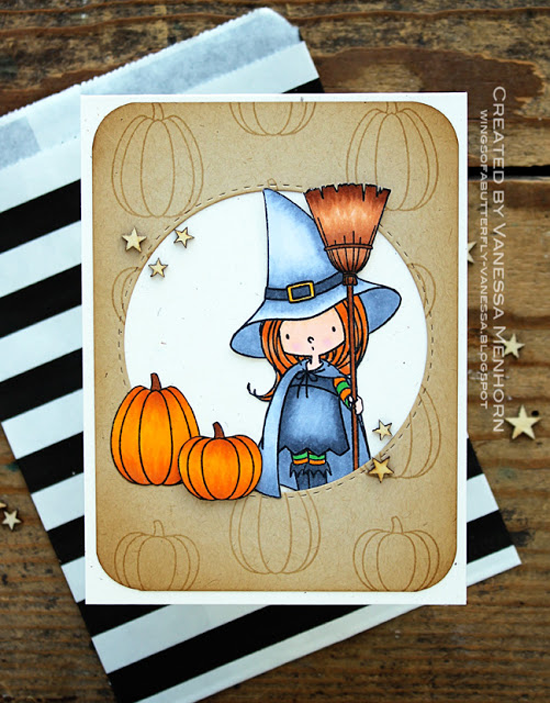 See you tomorrow for the next Sketch Challenge, and look for a new MFT Color Challenge Thursday, October 8th! Also happening tomorrow is the big reveal of our Ten Card Design Superstars! We can't wait to share the news! Be sure to check out the My Favorite Things Blog at 8 am EDT to see they fabulous winners and their inspiring cards! Thanks for the spot Jill! I just couldn't resist these sweet kitties and the idea for the fishbowl just sounded like fun. Thanks for the shout out Kay! Wishing I was on that tropical beach today! 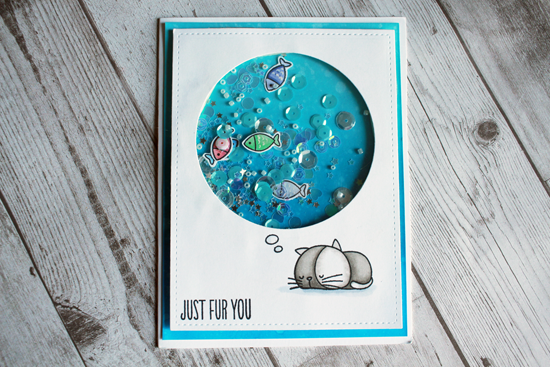 Beautiful, creative cards, congrats on being "spotted"!! Eek! What a fun surprise to see my card here with these other amazing creations! Thanks, Mayuri!